Adeleke speaks: My victory indicates PDP will win 2018 Osun governorship election – Royal Times of Nigeria. 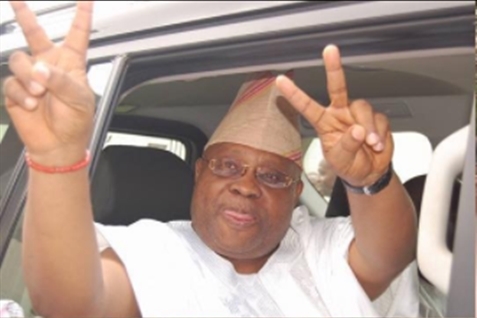 Mr. Adeleke scored 97,480 votes and won in nine of the 10 local government areas where the election was held. 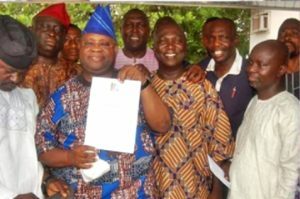 Ademola Adeleke, the Peoples Democratic Party, PDP, candidate in Saturday’s Osun West Senatorial District bye-election, has described his victory as a new dawn for democracy. Adeleke said, at a news conference on Sunday in Ede, that his electoral victory was “a pointer that PDP will be victorious in the 2018 governorship election in the state’’. The News Agency of Nigeria reports that Mr. Adeleke scored 97,480 votes and won in nine of the 10 local government areas where the election was held. The All Progressives Congress, APC, candidate, Mudashiru Husain, polled 66,116 votes and won in only one local government area. The late Isiaka Adeleke, the first Executive Governor of Osun, was occupying the senatorial seat until his death on April 23. He subsequently defected to PDP and was given the party’s ticket to be its candidate in the election. He said: “We are working hard to ensure that the 2018 governorship election in Osun is won by PDP. “My victory is a new dawn in the history of our democracy. “Our democracy is growing where an incumbent will be there and opposition will defeat the incumbent. “This is a rare gem and this shows that our democracy is improving. Adeleke, however, commended the Independent Electoral Commission (INEC) and the security operatives for ensuring that the election was free and fair. Mr. Adeleke also commended journalists for their sense of professionalism in the coverage of the election. “I can assure you that I will continue from where my late brother left it and that is where I tag my campaign continuity,” he said. “I have budgeted N250 million for students’ scholarship, empowerment programme for women as well as free mobile medical care,” the senator-elect said.